This excellent painting, so strikingly different, simple and elegant, giving plenty of space not only for the depicted action but also to the sky to let it display its glory, to the land to let it stretch to the horizontal line, and to the ocean to let it mark at least its presence, portrays the climax of Rama-katha  story of the life of Rama. The painting has been rendered using characteristic South Indian art idiom in iconography, body complexion, style of costumes, type of crown, and jewellery. The battle is heading towards an end. All of Ravana's sons and his most other warriors have been killed. Ravana himself is in the battlefield now for a few days and has been shot at by Rama many times but his arrows cut sometimes a few of his twenty arms, and sometimes, one or two of his ten heads. Before Rama shoots at him again, there grow in place of Ravana's severed heads and arms as many new ones. This somewhat disappoints Rama. ., who accompanied Rama in the battlefield, were able to think of a way-out that would bring Ravana's end. One evening, after the day's battle, Rama even lamented that he would not perhaps meet Sita ever again. Ravana's brother, Vibhishana who had quit Ravana and had joined Rama's side, though he was not accompanying him in the battlefield, was in the camp. He immediately apprehended the situation. He disclosed that his brother had nectar in his navel and unless it was burnt, he would not die. He pointed out that Ravana either rode a chariot or by his occult powers moved above the ground. As Rama was shooting his arrows from ground level, they never struck him on his navel. Vibhishana, hence, suggested Rama that he should ride a chariot, so that he struck Ravana straight in the navel from the same height, which alone would bring Ravana's end. All present in the camp realised that an arrow shot from below could hit an arm, head or any other part of Ravana's body but not his navel. They hence wished that Rama accepted Vibhishana's suggestion. But, it was not possible for Rama. At the time of leaving Ayodhya, he had vowed not to ride a chariot, horse or a vehicle, during the fourteen years of his exile. He hence traversed on foot all distances and every mission including his battle against Ravana. He hence declared that he would prefer defeat to breaking a vow. But, an idea struck in Hanuman's mind. He proposed that in the battlefield, he would carry his master on his shoulders and whenever his master aimed his arrows at Ravana, he would, by his supernatural powers, rise to such heights as had Ravana. Rama accepted the idea. The other day, carried over the shoulders of Hanuman, he fought his battle against Ravana. He hit him into his navel and was thus able to kill him. In the painting, Rama, carried over the shoulders of Hanuman, and the ten headed and twenty armed Ravana, equipped with various weapons, are face to face. Rama is aiming his arrow at Ravana and vice versa Ravana at Rama. The artist has symbolised dimensions of war by depicting a monkey overpowering a Lankan warrior, probably one of Ravana's sons. Rama is carrying, besides his bow and quiver, also a sword. 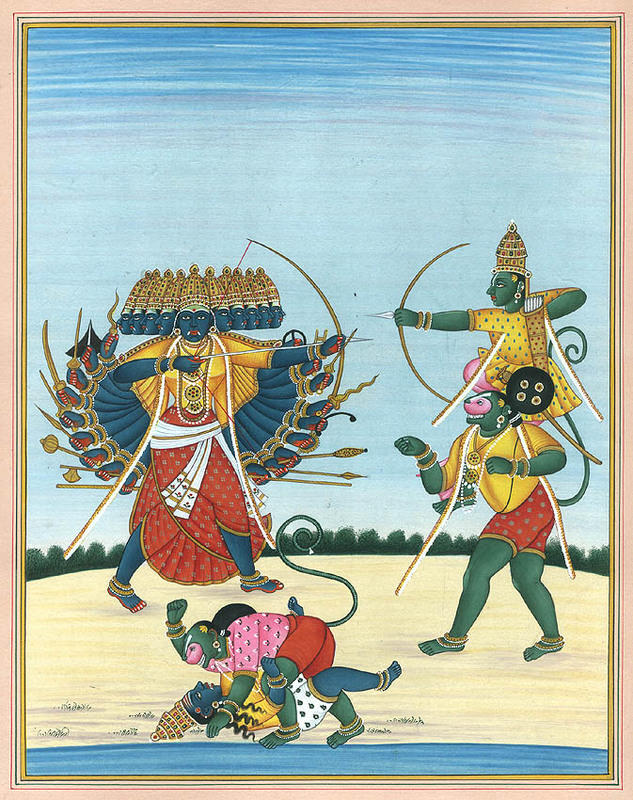 Rama, Hanuman and a monkey warrior are in green, a characteristic feature of the South Indian iconography, and Ravana and one of his sons are in blue. Hanuman's loincloth and Ravana's 'dhoti' are exactly similar. The upper garments of Rama, Ravana, Hanuman and Ravana's son are rendered in same yellow but they are differently painted and fashioned. Hanuman and the other monkey warrior are without a headdress, whereas Rama, Ravana and his son are wearing similar characteristically South Indian crowns. Ornaments of all figures are also alike fashioned.